WASHINGTON — The U.S. Justice Department is not releasing the investigation into how and why a young, unarmed mother was shot to death by federal officers in the shadow of the Capitol dome, so the attorney for the family of Miriam Carey has done some investigating of his own. Eric Sanders, who previously worked as a police officer for the New York Police Department, can survey a crime scene with a trained eye. 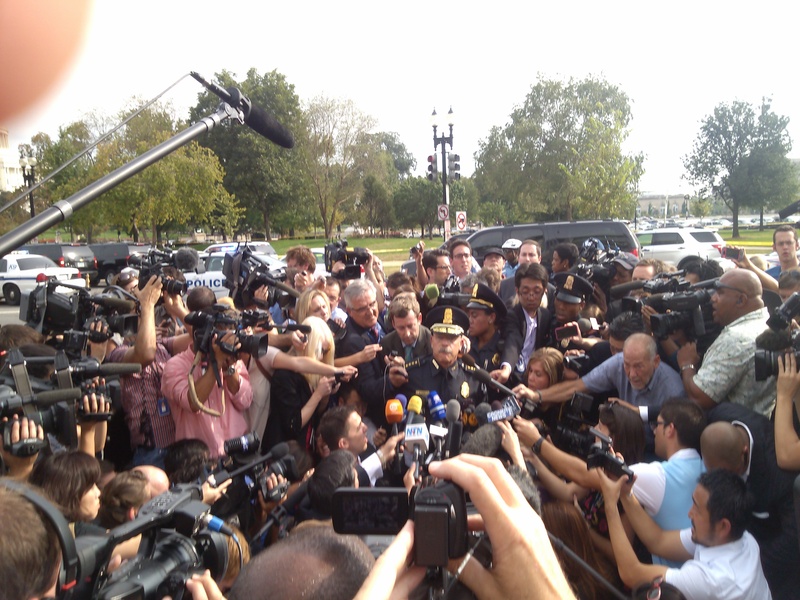 The mystery is why Carey was shot to death by U.S. Capitol Police officers and uniformed Secret Service agents. It has been almost four months since Carey was killed on Oct. 3, 2013. Serious questions have steadily emerged about the shooting of the dental hygienist from Stamford, Conn., ever since police chased her black Nissan Infiniti from the White House to the Capitol, then shot her to death, apparently with her infant child in the back seat. Contrary to media reports, the initial police report shows Carey did not ram a barrier at the White House. Carey only tried to make a U-turn at the White House. It appears she may have arrived at the White House checkpoint by mistake. She apparently broke no laws until fleeing after being confronted by heavily armed guards. Authorities did not use non-lethal means to try to stop her car, such as setting tire spikes or shooting out her tires. Shooting at moving vehicles is against the policy of the Washington, D.C., Metro police and against the policies of many big-city police departments. Officers appeared to get ample opportunity to see there was a child in the car before opening fire. Authorities apparently did not employ non-lethal means to subdue Carey, such as pepper spray or a Taser, before shooting her to death. Legal and civil rights experts from across the political spectrum have told WND the shooting does not appear justified. Renowned journalist Nat Hentoff told WND it appeared officers “murdered” Carey. The investigation was conducted by the Washington, D.C., Metropolitan Police then turned over to the U.S. Attorney at the Justice Department for review. A spokesman for the U.S. Attorney told WND that is standard practice for investigations that include officer-involved shootings. What does not appear to be standard practice is the amount of time it is taking to release the investigation report. When two months had passed, Sanders told WND it was not an unusual length of time for such a multifaceted investigation, involving more than one law enforcement agency. However, now that nearly four months have passed, the fact the report still has not been released is becoming a mystery unto itself. So, Sanders came to Washington to discover what he could see for himself. The former police officer told WND that over the course of a few days he observed the operations of the Metro Police, U.S. Secret Service – Uniform Division and U.S. Capitol Police around the White House, Capitol grounds and other areas in the immediate vicinity. Sanders said the purpose of his observations was to rebut and/or support various theories as to how Carey was killed. “Without giving away all of my observations of their respective police operations, I can see how the shooting of Miriam unfolded,” revealed Sanders. He emphasized the key to understanding Miriam’s “untimely, avoidable death” begins at the corner of 15 Street NW and Pennsylvania Avenue NW (the location of the U.S. Department of Commerce building) or E Street (White House entrance checkpoint), which is essentially the same corner. That echoes what was told to WND by Dan Bongino, a candidate for Congress in Maryland and former Secret Service agent who personally guarded Presidents George W. Bush and Barack Obama, as well as the author of the New York Times bestseller “Life Inside the Bubble: Why a Top-Ranked Secret Service Agent Walked Away From It All,” published by WND books. He thinks there will be “a serious remodel” of some of the security on the south side of the White House, following this incident. The former protector of the president didn’t want to divulge too much about security measures there, but said there did appear to be an access-control issue. Based on his personal survey, Sanders indicated video may be the key to understanding what happened to Carey at that White House South entrance, once the investigation is released. WND did its own site survey of the scene where Carey was killed, and discovered at least seven security cameras in the immediate vicinity of the fatal police shooting Oct. 3, while a number of police cruiser dash-cams also likely recorded the incident as police surrounded Carey’s car. While cell-phone cameras recorded the initial volley of shots fired by police at Carey’s car on the south side of the Capitol, none capturing the fatal shooting to the northeast of the Capitol at Second Street and Maryland Avenue have surfaced. Officials won’t even confirm if video of the incident exists. It may be understandable why police would be reluctant to release that video, as it might confirm what legal experts and civil libertarians from both left and right sides of the political spectrum have told WND, that they believe Carey was, in effect, murdered by police. 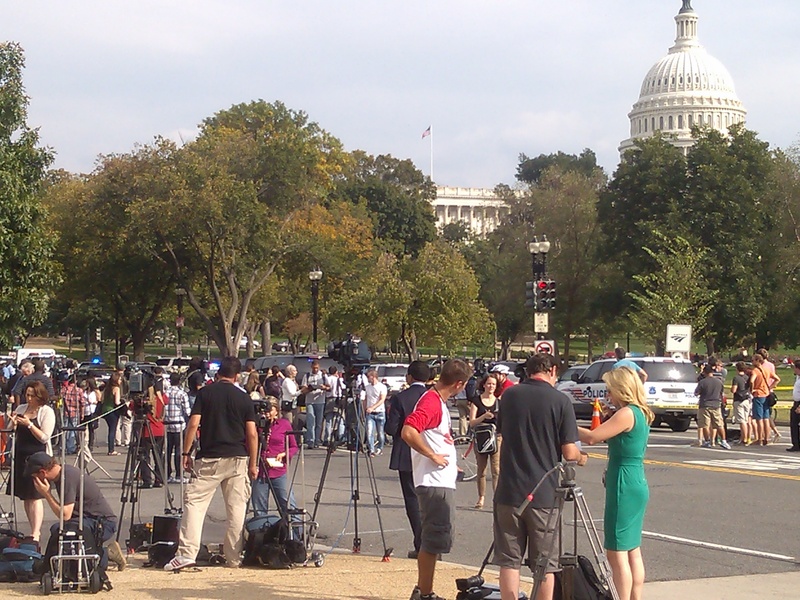 WND attempted to obtain video of the shooting death of Carey in the shadow of the nation’s Capitol by filing a Freedom of Information Act, or FOIA, request. The request was denied by Metro Police. By telling WND that releasing the video might adversely affect any criminal proceeding, police have essentially admitted such video might cast a bad light on the conduct of officers and agents. The withholding of the video also confirmed that authorities are at least considering the possibility of pressing charges against officers and agents involved in the shooting of Carey. WND has now appealed the denial of its FOIA request for the video to the office of Vincent Gray, the mayor of Washington, D.C.
WND has also filed a FOIA request seeking the forensics report on the shooting but has received no reply to multiple inquiries regarding the status of the request. In appealing to Mayor Gray to release the video of Carey’s shooting, WND noted that it would serve the public interest by allowing citizens to objectively decide for themselves what happened on that day. WND also noted that nearly three months have passed since the shooting, with no word on the status of the investigation. Meanwhile, police departments in other major cities such as Philadelphia and Las Vegas have released videos of officer-involved shootings before their investigations were complete. Video of the first shooting incident involving Carey (at the Garfield Monument traffic circle) is already public. Withholding existing video on the second, fatal, shooting involving Carey (at the guard house at Constitution Avenue NE & 2nd Street NE) doesn’t seem to make sense. The Secret Service, Capitol Police and Washington Metro Police have withheld virtually all details of the shooting from the family of Carey and the public. The details include forensics reports that would show how many times Carey was shot, her cause of death, the position of the body at the time of death, video and photos, multiple eyewitness accounts and an explanation as to why police believed deadly force was necessary to subdue her while she was unarmed and had her infant daughter with her. Sanders has asked Holder to investigate the incident for possible civil rights violations but has yet to receive a response. Sanders is also calling on Congress to investigate the shooting death. He told WND no members of Congress have contacted the family. In fact, lawmakers, who were told that police fired because of concerns of terrorism, congratulated officers for shooting the young, unarmed mother with a 30-second standing ovation, shortly after her death. An unknown number of Secret Service officers and two U.S. Capitol Police officers involved in the shooting of Carey have been shifted to desk work while the incident is under investigation. “While, we understand police shootings must be carefully investigated because of their social and political ramifications, by now, there should have been a preliminary analysis released in the public venue,” explained the attorney. As WND reported, officers fired at Carey on at least two occasions during a car chase that began at the White House, after she tried to make a U-turn at a checkpoint. At least seven shots fired in a crowded public space can be heard on a video recording after officers failed to stop Carey’s car at a traffic circle just south of the Capitol. 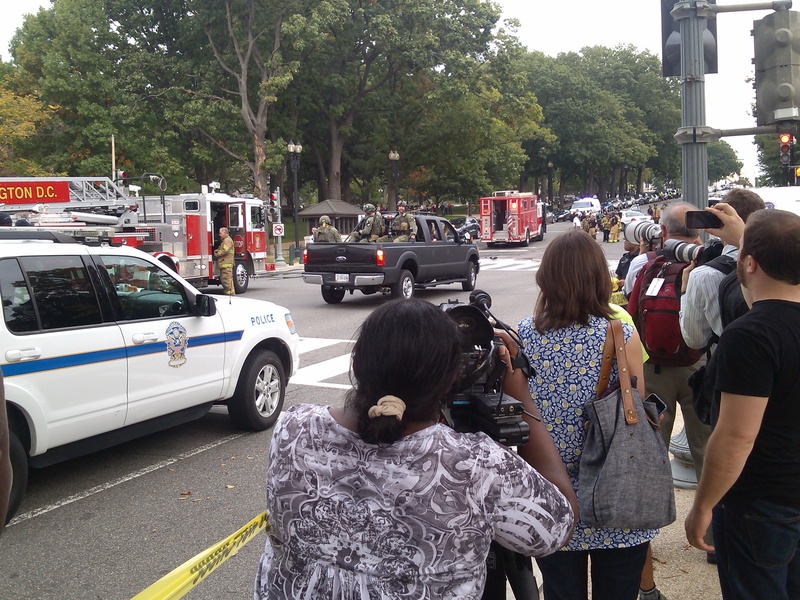 A few minutes later, officers shot Carey to death, a block northeast of the Capitol. It is not known how many shots officers fired at Carey while killing her because police have not released the forensics report. Dan Bongino, former Secret Service agent and author of the New York Times bestseller, “Life Inside the Bubble: Why a Top-Ranked Secret Service Agent Walked Away From It All,” was reluctant to second-guess the actions of law enforcement officers in a fast-moving and confusing situation and loath to evaluate their decisions in hindsight. WND interviewed the victim’s sister, Valarie Carey. She and her attorney, Sanders, are both former New York City police officers. Valarie took exception to the media’s description of her sister. All four of the experts who spoke with WND agreed the incident was mishandled by law enforcement from the beginning, but it was also mishandled by the media. Establishment media outlets such as the New York Times, NBC and ABC News all reported that Carey tried to ram a White House gate or checkpoint. 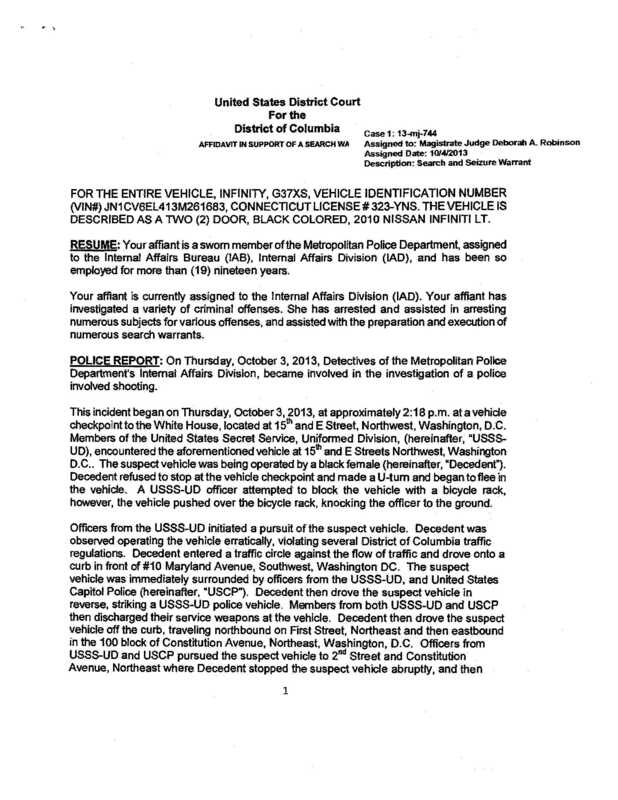 However, the police report did not mention a White House gate, a barrier or any attempt to ram anything. A WND review of the known facts revealed police may have posed a greater threat to public safety than Carey did. It appears she never violated any law until police began pursuing her car. Officers, on the other hand, fired numerous shots at her in a crowded public space near the White House, as the video above shows. WND asked Whitehead, could the actions of the police have been warranted because of so-called high-value targets at the Capitol and the White House? He said no, adding that he believes police overreacted by shooting at Carey when they could have employed an alternative. He wondered, why didn’t they just shoot her tires out? Mack said police missed an opportunity when they first had her car surrounded, which was precisely when they should have blocked her in with their vehicles. Indeed, the video shot at the Garfield Monument shows police had that opportunity. Instead, two, perhaps even three, cruisers parked behind Carey’s car, rather than boxing her in on the passenger side. Because officers did not surround Carey then and there, they left her a clear path to leave the scene. The audio on the video recorded police firing at least seven shots as she departed. The former sheriff said firing those shots under those circumstances is against policy in most police agencies. “Regardless, Carey’s action did not even come close to allowing police shooting at her,” he said. The fact there was a child in the car further complicated the decision to shoot. 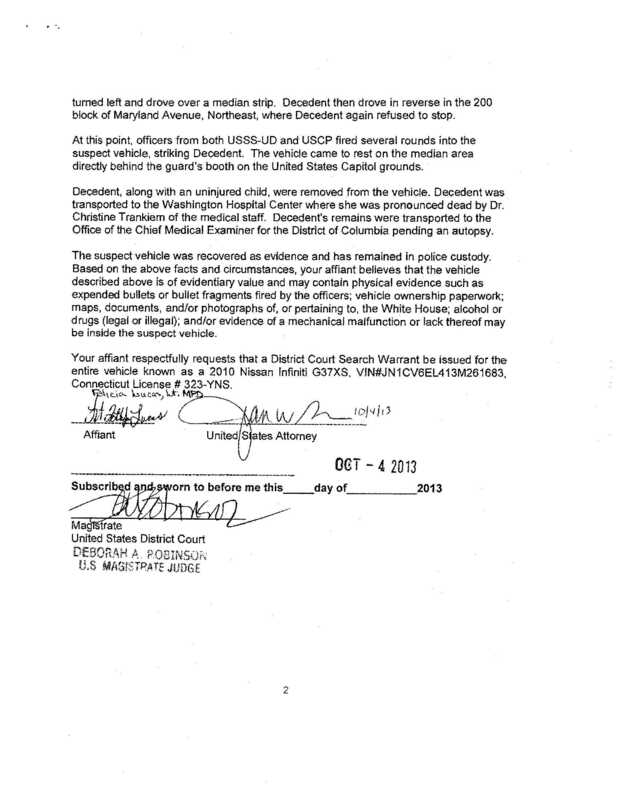 The police report does not say whether officers saw the child in the car. But the video shows five of the six officers who surrounded her vehicle on foot appeared to get an extremely close and clear look inside. It would seem difficult to believe that at least one of them did not see the toddler in the car seat. Mack said the officers must have seen that a child was in the car, making the need for restraint by the police even more necessary. Furthermore, he said the use of deadly force under those circumstances should have been absolutely forbidden. Many wonder why police did not simply use pepper spray or a Taser, or why they did anything at all when they caught up with Carey. Hentoff and Whitehead both firmly believe the case is an example of a growing “shoot first, ask questions later” mentality spreading across the nation among law enforcement agencies. They argue it is directly related to a change in training and a militarization of police departments across the country. Whitehead said the danger the officers created to public safety reminded him of a Sept. 14 incident when New York police officers fired three shots on a crowded Manhattan street near Times Square, missing the man they mistakenly believed had a weapon but hitting two bystanders. Whitehead told WND the “shoot first, ask later” problem begins at police academies. He said a chief of police who teaches at academies informed him that rookies are learning a militarized version of law enforcement. He said a range of psychological factors condition officers to act more like soldiers, from the militarized, black uniforms to the ubiquitous use of SWAT teams. Whitehead said he works with many police officers who tell him it has become a problem but they don’t know what to do. One even told him he dropped out of the police academy because of what he called “the thug complex” they’re teaching police. He believed the militarization of the police began in the 1980s, when the Department of Defense “began handing out all this equipment” such as MRAPs, or Mine Resistant Ambush Protected vehicles. When WND asked if the equipment was introduced to fight rising crime, Whitehead instead saw a profit motive by the corporations that make the tank-like vehicles and have made a lot of money by lobbying the government. Whitehead said there’s a sinister alliance between federal and local authorities that results in suppressed dissent and basic First Amendment rights. Whitehead said the militarization of local police slowed under former President George W. Bush but picked up speed under Obama. Whitehead indicated he believes Homeland Security is actually turning into a national police force. The legal scholar said that’s because most Americans don’t understand the Fourth Amendment of the Constitution prevents police from such outrageous practices as strip searches without probable cause. Hentoff told WND “there is no question” about the growing militarization of the police. The veteran journalist feels New York Police Commissioner Ray Kelly has taken his department’s “stop and frisk” policy beyond constitutional limits by stopping people on the street without sufficient cause, a position echoed by the city’s liberal establishment. Hentoff finds the Carey case a particularly ominous harbinger, indicating the country is in “severe danger” of becoming a police state. The nation is not there yet, he said, because the First Amendment is still working, and independent media such as WND are still free to sound the alarm. But, the civil libertarian believes the Carey case dramatizes some serious underlying tendencies toward becoming a police state, judging by reports he has heard from around the country. According to Hentoff, what happened to Carey is “an extraordinary example of how police have no limits when they get into this sort of situation,” and how they are out of control in many areas around the country. He said the only thing that can put a limit on police power would be accountability. Because the evidence is so strong that the police recklessly killed Miriam Carey, Hentoff said, the officers involved and their superiors must be held to account for her death, for the sake of the country. Troops arrive near where Carey was killed. WND photo by Garth Kant. Valarie noted how the news cycle died down once it became clear she was not a terrorist threat. Hentoff worried that if stories like this are allowed to die, the danger of becoming a true police state will only increase. That is why he believes it is such an important story. “Because, if we are ever going to become a police state, eventually the First Amendment will die along with this poor woman,” he said. The highly acclaimed journalist commended WND for pursuing the story. Another national gravely concerned about the Carey shooting is Blackwater security-firm founder and former Navy SEAL Erik Prince. While defending the record of his private security company in Iraq, Prince described to an interviewer on MSNBC how dangerous things happen not just in war zones, but even in the nation’s capital. Prince recounted how Carey ended up dead at the hands of Secret Service agents and U.S. Capitol Police officers. Near where Miriam Carey was shot.WND photo by Garth Kant. Filing a FOIA with police wasn’t the only way WND tried to obtain video of the Carey shooting. Authorities initially feared the incident was an act of terrorism, so it would seem logical that the National Security Agency might have monitored the chase and the shooting with its satellites. But an NSA spokesman said it does not have video of the incident: “We are a foreign-intelligence agency.” The NSA advised WND to check with the FBI or DHS. Also, the bureau would not confirm or deny the existence of dash-cam or security-cam videos of the shooting. And a spokesman for the Department of Homeland Security declined to comment.